« What do you plant in the Spring? We FINALLY got our sod installed.. It was a long time coming. We had officially gotten our yard ready for sod, when THE DAY BEFORE it was supposed to come, I broke my ankle.. So we decided to postpone it until the next spring, and here we are! So sod is actually quite resilient. There are just a few things you should worry about when installing sod. Make sure your soil is amended. Many times people will pull out an old yard, or put in grass in a newly built home, but they neglect to put any soil amendments into the soil before installing the grass. 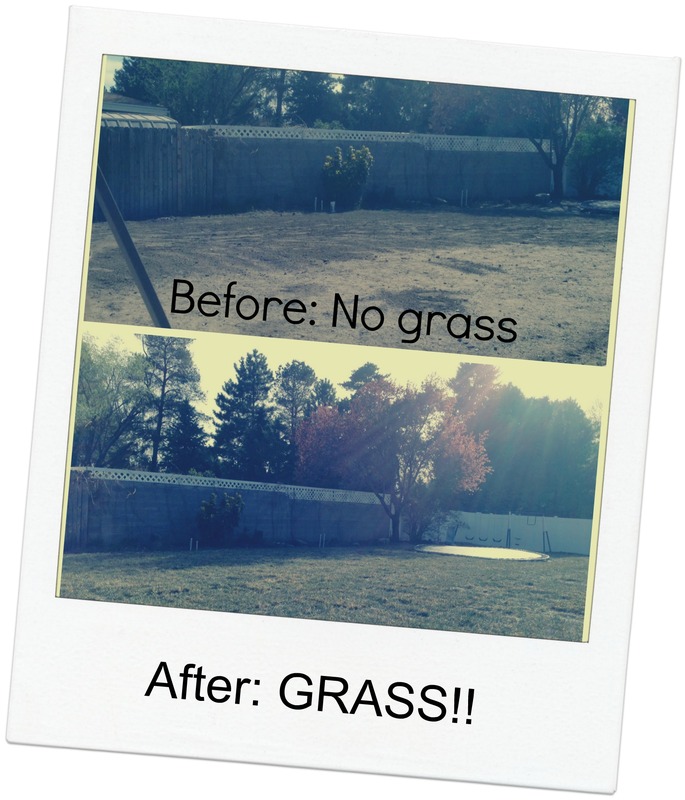 The organic matter helps to have the grass establish itself quickly and grow to be a healthy lawn. You don’t want to have to fertilize it too quickly after installing it. So take the time to add in some good organic matter to the soil before putting the grass in. You’ll thank me later. Make sure your sprinklers have FULL coverage before installing grass. Many times the sprinkler system is inadequate and you will end up with dead sod pretty quickly if that is the case. A little prep work before it is installed will save you in the future. Keep moist, but you don’t need to drown it either. Because it is spring, I will not have to water my new sod nearly as much as if it was installed in the summer time. Water to keep quite moist- those roots loose moister faster than when they are established down into the ground. So pay attention to the weather and how moist it is! and make decisions based on your OWN circumstances. Keep kids and dogs OFF it as much as possible. Have you ever seen likes of where dogs pace in lawns? Walking on lawns can even be hard on them when they are established! So they will die much faster when they don’t have a good root base yet! So for a few weeks while it is getting established- keep kids and dogs off. I put up a little temporary fence to keep my dog off, and gently remind my kids to not venture onto it. Sod establishes much faster than seed! yes, you can get an awesome looking lawn from seed, but it is sometimes difficult to keep up with the weed seeds that get in there, and if you have a dog and kids like I do, you may want to think about the time frame that you will have to keep them off- vs sod. A few months or a few weeks.. I chose the later. AND it is less work. Easy decision. What is your opinion? Do you like SOD or SEED? I would love to know the experience you had with that! And any tips you have for me as we wait for the grass to root down. What do you plant in the Spring?